Sketch H Showing th Progress of the Sur5vey in Section No. VIII from 1846 to 1871. / Sketch I Showing the Progress of the Survey in Section No. IX from 1848 to 1871. An uncommon example of the 1871 U.S. Coast Survey progress and triangulation chart or map of the Gulf Coast from Mobile Bay, Alabama to Corpus Christi, Texas. essentially two maps on a single sheet, the upper map covers from Mobile Bay to Terre Bonne Bay, including the Delta of the Mississippi River and Lake Pontchartrain. The lower section continues the coast westward from Galveston Bay to Corpus Christi, inclusive of Matagorda Bay. The U.S. Coast survey began its work in this region in the late 1840s. Work progressed throughout the 1850s only to be halted in the early 1860s with the onset of the American Civil War. Following the War additional survey teams were sent to the region well into the 1860s. 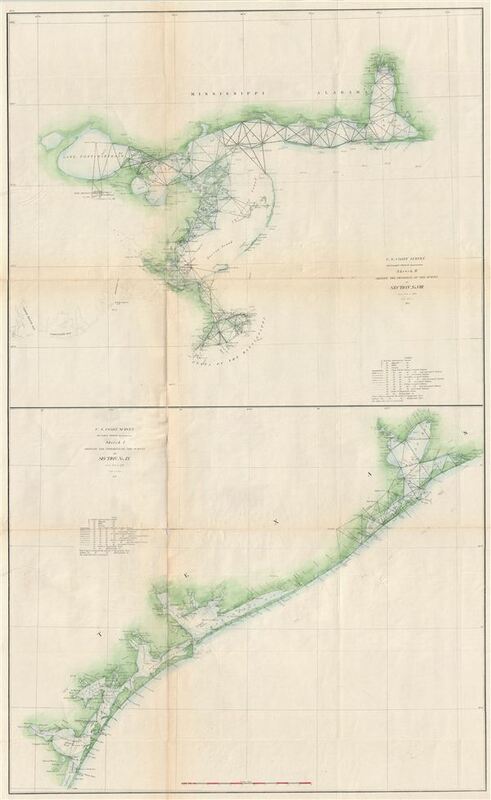 Progress maps of this sort were made to illustrate work of the survey and accompanied the Superintendent of the Survey's (Benjamin Pierce) annual report to Congress. Good. Typical discoloration and wear along original fold lines. Backed with archival tissue for stability.